From the SXSW department... Thanks Elliot for the heads up! Black Sheep with Zeale and Phranchyze @ Emo's tonight, March 12th! So this is the time of year that Austin gets really nuts, I'm talking about SXSW! Once again, being Asian, I was too cheap to buy a badge. ;) So help me out, leave a comment and tell me what free shows you're planning on hitting? Black Sheep is an alternative hip hop duo from Queens, New York, composed of Andres "Dres" Titus and William "Mista Lawnge" McLean. The duo are native New Yorkers but met as teenagers in North Carolina where both of their families relocated. The group was an affiliate of the Native Tongues Posse, which included The Jungle Brothers, A Tribe Called Quest and De La Soul. It debuted in 1991 with the hit song "Flavor of the Month" and later released their first album, A Wolf in Sheep's Clothing, which gained them praise and recognition in the hip-hop community for the album’s unique rhythms and intelligent lyrics. 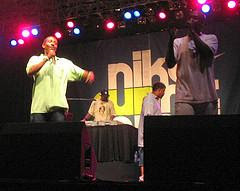 Black Sheep was the first hip-hop act to appear on The Tonight Show with Jay Leno after the departure of Johnny Carson. Black Sheep was also one of the first groups to parody gangsta rap (still in its infancy when A Wolf In Sheep's Clothing was released) in the hilariously over the top "U Mean I'm Not." In the song, Dres describes in detail killing his sister, his parents, and his letter carrier. At the end, he is roused from his sleep and tells his friends bewilderedly, "I dreamed that I was...hard."